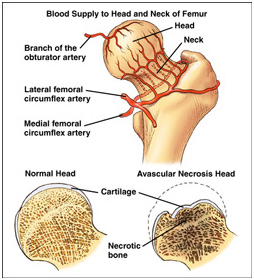 Although it can happen in any bone, avascular necrosis most commonly affects the ends (epiphyses) of long bones such as the femur, the bone extending from the knee joint to the hip joint. Other common sites include the upper arm bone, knees, shoulders, and ankles. The disease may affect just one bone, more than one bone at the same time, or more than one bone at different times. Avascular necrosis usually affects people between 30 and 50 years of age; about 10,000 to 20,000 people develop avascular necrosis each year. Injury : - When a joint is injured, as in a fracture or dislocation, the blood vessels may be damaged. This can interfere with the blood circulation to the bone and lead to trauma-related avascular necrosis. Studies suggest that this type of avascular necrosis may develop in more than 20% of people who dislocate their hip joint. Steroid Medications : - Corticosteroids such as prednisone are commonly used to treat diseases in which there is inflammation, such as systemic lupus erythematosus, rheumatoid arthritis, inflammatory bowel disease, and vasculitis. Studies suggest that long-term, systemic (oral or intravenous) corticosteroid use is associated with 35% of all cases of nontraumatic avascular necrosis. However, there is no known risk of avascular necrosis associated with the limited use of steroids. Patients should discuss concerns about steroid use with their doctor. Alcohol Use : - Excessive alcohol use and corticosteroid use are two of the most common causes of nontraumatic avascular necrosis. In people who drink an excessive amount of alcohol, fatty substances may block blood vessels, causing a decreased blood supply to the bones that results in avascular necrosis. Other Risk Factors : - Other risk factors or conditions associated with nontraumatic avascular necrosis include Gaucher's disease, pancreatitis, radiation treatments and chemotherapy, decompression disease, and blood disorders such as sickle cell disease. X-Ray : - An X-ray is a common tool that the doctor may use to help diagnose the cause of joint pain. It is a simple way to produce pictures of bones. The X-ray of a person with early avascular necrosis is likely to be normal because X-rays are not sensitive enough to detect the bone changes in the early stages of the disease. X-rays can show bone damage in the later stages, and once the diagnosis is made, they are often used to monitor the course of the condition. Magnetic Resonance Imaging (MRI) : - MRI is quickly becoming a common method for diagnosing avascular necrosis. Unlike X-rays, bone scans, and CT (computed/computerized tomography) scans, MRI detects chemical changes in the bone marrow and can show avascular necrosis in its earliest stages. MRI provides the doctor with a picture of the area affected and the bone rebuilding process. In addition, MRI may show diseased areas that are not yet causing any symptoms. Bone Scan : - Also known as bone scintigraphy, bone scans are used most commonly in patients who have normal X-rays. A harmless radioactive dye is injected into the affected bone and a picture of the bone is taken with a special camera. The picture shows how the dye travels through the bone and where normal bone formation is occurring. A single bone scan finds all areas in the body that are affected, thus reducing the need to expose the patient to more radiation. Bone scans do not detect avascular necrosis at the earliest stages. Computed/Computerized Tomography (CT Scan) : - A CT scan is an imaging technique that provides the doctor with a three-dimensional picture of the bone. It also shows "slices" of the bone, making the picture much clearer than X-rays and bone scans. Some doctors disagree about the usefulness of this test to diagnose avascular necrosis. Although a diagnosis usually can be made without a CT scan, the technique may be useful in determining the extent of bone damage. Biopsy : - A biopsy is a surgical procedure in which tissue from the affected bone is removed and studied. Although a biopsy is a conclusive way to diagnose avascular necrosis, it is rarely used because it requires surgery. Functional Evaluation of Bone : - Tests to measure the pressure inside a bone may be used when the doctor strongly suspects that a patient has avascular necrosis, despite normal results of X-rays, bone scans, and MRIs. These tests are very sensitive for detecting increased pressure within the bone, but they require surgery. Appropriate treatment for avascular necrosis is necessary to keep joints from breaking down. If untreated, most patients will experience severe pain and limitation in movement within 2 years. Several treatments are available that can help prevent further bone and joint damage and reduce pain. Core decompression : - This surgical procedure removes the inner layer of bone, which reduces pressure within the bone, increases blood flow to the bone, and allows more blood vessels to form. Core decompression works best in people who are in the earliest stages of avascular necrosis, often before the collapse of the joint. This procedure sometimes can reduce pain and slow the progression of bone and joint destruction in these patients. Osteotomy : - This surgical procedure reshapes the bone to reduce stress on the affected area. There is a lengthy recovery period, and the patient's activities are very limited for 3 to 12 months after an osteotomy. This procedure is most effective for patients with advanced avascular necrosis and those with a large area of affected bone. Bone graft : - A bone graft may be used to support a joint after core decompression. Bone grafting is surgery that transplants healthy bone from one part of the patient, such as the leg, to the diseased area. Commonly, grafts (called vascular grafts) that include an artery and veins are used to increase the blood supply to the affected area. There is a lengthy recovery period after a bone graft, usually from 6 to 12 months. This procedure is complex and its effectiveness is not yet proven. Clinical studies are underway to determine its effectiveness. Arthroplasty/total joint replacement : - Total joint replacement is the treatment of choice in late-stage avascular necrosis and when the joint is destroyed. In this surgery, the diseased joint is replaced with artificial parts. It may be recommended for people who are not good candidates for other treatments, such as patients who do not do well with repeated attempts to preserve the joint. Various types of replacements are available, and people should discuss specific needs with their doctor. Avascular necrosis or osteonecrosis or aseptic (bone) necrosis or ischemic bone necrosis, is a disease resulting from the temporary or permanent loss of the blood supply to the bones. Due to lack of blood supply, the bone tissue dies and causes the bone to collapse. If the process involves the bone near to a joint, it often leads to collapse of the joint surface. A variety of methods are now used to treat Avascular necrosis, the most common being the total hip replacement (THR). However, THRs have a number of downsides including a long recovery time and short life span of the replacements. Hence Adult Mesenchymal Stem cells by its Angiogenic and Osteogenic properties, have a great therapeutic potential in these ailments which are difficult to treat with existing modalities of treatment.